What Willie Jones remembers best is all the walking. Favorite hole at the Augusta National:Hole number 17 because it’s the most difficult. My Jack Nicklaus moment: We played with him one time; Brewer was getting some tips from him! I’ve also met: Clifford Roberts, Gary Player and Chi-Chi Rodriguez. Do you still play? I still can hit the ball; I can’t see where it’s going,but I can still hit it! And he did. Jones donned the white suit of an official Augusta National caddie when he was just 25 years old. Most days he’d sit with the other caddies at the caddy shop, waiting for his name to be called so he could sling a golf bag over his shoulder and head over to the clubhouse. But every April, it was a different story. One of Jones’s favorite memories is caddying for Masters champion Gay Brewer. While Jones didn’t caddy for him during his 1967 championship year, he did hold his bag in 1973, the year that Brewer won the Par 3 contest and ended tied for 10th place. Afterwards, Jones recalls, the champion wrote him a generous check as a thank you. That life ended when Jones was blinded in a car accident in 1974, but he didn’t let his disability hold him back. Jones sold candy, was a telemarketer for The Augusta Chronicle, even sold shoes, until he joined Walton Options for Independent Living. There he was a computer instructor and peer supporter, teaching others who were blind. In fact, the boy who used to walk the streets of Augusta taught himself how to use a computer. “I’ve got an iPad right here,” Jones says with a chuckle. Three new gallery spaces are injecting even more creativity into Augusta’s downtown art scene. The Westobou Gallery opened last year as part of the Westobou Festival and not only serves as a permanent space for the annual event but also hosts shows throughout the year. The Greater Augusta Arts Council opened the Community Gallery in the median at 600 Broad St. (in the former Chamber building) to present quarterly shows featuring emerging artists. Purely Painted Market features painted furniture and décor as well as workshops and chalk paint by CeCe Caldwell, Clay Paints and Finishes, brushes and supplies for your own projects. IT’S 10! Walton Foundation for Independence celebrates the 10th year of its popular Undercover Artists Show fundraiser this year on April 28 at a new location, the Legends Club, 2701 Washington Rd., honoring artists who have been a part of this silent auction event since its inception. One of those artists was local sculptor and artist Kath Girdler Engler, who passed away in 2014. The foundation held the inaugural 5K Run With Art in Memory of Engler last year and the second annual event takes place this year on Saturday, April 23, the weekend before the Undercover Artists Show. Engler loved children and art, and both events reflect that: They benefit Walton Foundation for Independence’s camps for children with disabilities, including Camp To Be Independent and Walton Winter Weekend. To find out more, to purchase tickets for the Undercover Artists Show or to register to run, walk or roll during the 5K Run With Art, visit www.waltonfoundation.net/events. The weekend before Thanksgiving, Augustans were treated to a little bit of “Happy,” a yellow, pink, white and black parade of trombone players, trumpeters and cheering crowds all marching behind Augusta artist Leonard “Porkchop” Zimmerman. That event was just one of the scenes shot as part of a documentary on Zimmerman that’s set to hit the indie film circuits this spring. Happy: A Small Film With a Big Smile was inspired by Zimmerman’s 2014 TEDx talk in Augusta. Filmed by producer/director Michael Patrick McKinley, the documentary will premiere in Augusta in May. To stay updated, visit www.gofundme.com/thehappydoc or search for Happy: A Small Film With a Big Smile on Facebook. ACCORDING TO Donna Jo Carroll, her true inner self doesn’t come out until she’s singing in front of a crowd. When she performs onstage, she becomes Donna Jo, an outgoing musical artist living inside an otherwise introverted and quiet person, who comes to life and finds her literal voice in music. While Carroll describes her sound as “country” in nature, she is quick to add that it’s nothing like the modern country-pop styles of today. And when you hear her sing, you realize how true this is. Carroll’s music is best described as a unique blend of old-school country, bluegrass, blues and soul. It’s a combination that defies the standard descriptions, which makes her stand out from the usual country crowd. Hailing originally from Fries, Va,, Carroll was raised on a steady diet of classic country and gospel and she claims to have started singing before she could talk. She moved to the Augusta area about five years ago and has performed with several local groups, but it wasn’t until last year that she made the leap of faith and began performing as Donna Jo, a full-time solo artist. Her efforts have paid off, as she was named Best Female Vocalist of 2015 in Augusta Magazine’s Best of Augusta, and she also received radio airplay on a local country radio station. Right now, she is concentrating on building and maintaining her audience base, both inside and outside of the Augusta area, continuing to make music full-time and seeing where her music career takes her next. In the meantime, she wants to remain true to her art and to herself. And for Carroll, the best way to do that is to get up onstage and shine in the spotlight. WHAT DO YOU RECALL ABOUT THE MASTERS? If it’s not the golf or the pimento cheese sandwiches, it’s likely the flowers you remember best. And it’s local florist Margaret Brown’s artistic touch that helped make them so memorable. Brown recently published a book, Augusta National & The Masters: A Florist’s Walk Down Magnolia Lane (with preface and photography by another well-known Augusta name, photographer Frank Christian) to memorialize her 27 years as the official florist of the Augusta National. 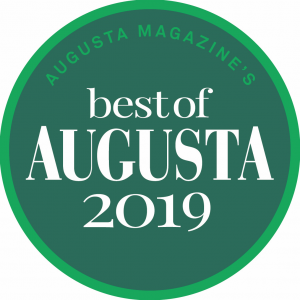 She digs into the history of Fruitland Nursery—the property that became the Augusta National Golf Club—as well as her own time spent creating stunning displays for the clubhouse, cabins, television sets and annual Champions dinners. The book is available in local bookstores as well as online at Amazon.com and Brown’s own site, www.createspace.com/5913043 as well as Sacred Heart Gift Shop and the Morris Museum of Art gift shop. Why go: Nothing says “getting away from it all” like your own private island. Think that can’t happen here in Georgia? Think again. Darien’s Eagle Island is only a short drive away, south of Savannah on Georgia’s coast—a glorious 10-acre escape featuring your own lodge that will sleep you and 11 of your closest friends and family. What Else: Bring your sense of adventure—or just a good book. Your island escape is what you make of it. Kayaking, boating, fishing, crabbing and birding are just a few of the outdoor activities available. The Lodge: Islanders get to stay in Eagle Lodge, a charmingly rustic yet luxurious vacation home featuring a 1,500-square-foot wraparound screened porch complete with swing bed, hot tub and outdoor fireplace, outdoor shower with heater and much more. And did we mention the views of the Darien River? Insider Tip: The one thing your island doesn’t have is restaurants. But you’ll dine well thanks to two fully equipped kitchens (both indoor and outdoor). So when you book, simply shop online at Harris Teeter and your groceries will be there when you arrive, including fresh local seafood if you wish. HER MOVIE AND TV ROLES have taken her to a high school for superheroes (Sky High) and had her running from killers (The Crazies), but Danielle Panabaker calls Augusta her hometown. Born here in September 1987, the young Panabaker traveled often in her real life too, thanks to her father’s sales job, but it was in Los Angeles that the budding actress honed her craft. Today she can be seen on TV as Dr. Caitlin Snow/Killer Frost on the WB’s The Flash. PRIVATE GOLF CLUB Champions Retreat is doing Masters week in style this year. Not only will the club be open to the public—offering golf, night-lit putting and driving range, live bands and special events, including an oyster roast and old-fashioned pig pickin’—but it also will unveil its new party barn during the week of the tournament. The 10,000-square-foot space will hold Southern soirees during Masters, but will be available throughout the year for corporate retreats, meetings, private banquets, watch parties and weddings. In keeping with its locale, the party barn will also feature memorabilia paying tribute to Arnold Palmer, Gary Player and Jack Nicklaus. The club is the only one in the world featuring three individually designed courses by the Big Three of golf, who each hold a special place in Masters history. THE 2016 MASTERS GOLF TOURNAMENT marks Allen Harison’s 25th anniversary as a volunteer on the first tee at Augusta National Golf Club. On the surface this may seem impressive but maybe not completely unique as the tournament has numerous long-time volunteers. But if you look more closely at the legacy of the Harison family, Allen’s tenure takes on deeper meaning. His great-grandfather Dr. William Henry Harison was one of the first Augusta residents to embrace the game, enthusiastically promoting the sport and serving as one of the early presidents of the Augusta Country Club for nearly 20 years. His son (Allen’s grandfather) W. Montgomery Harison was also an avid participant in the sport from an early age, becoming Georgia State Champion in 1921 as well as a charter member of the Augusta National. In fact his home for many years was on Berckmans Road, just behind the first green overlooking the course. The next generation of Harisons, Allen’s father W. Montgomery Jr. and his uncle Phil, both of whom grew up in the Berckmans Road house, exhibited an equal passion for the game of golf and loyal support of the club. And in 1981, at age 13, Allen followed in their footsteps, serving as a volunteer on the first tee almost every year since then. He is joined in that role by his cousins Phil S. Harison Jr., and Justice Taylor—marking the fourth generation of support by the Harison family.